Join SNHU alumni and community members for an evening with Rev. Seifu Anil Singh-Molares, MTS: Zen Buddhist Priest, Global Executive Leader, Social Entrepreneur, and Woodrow Wilson Fellow. In a conversation facilitated by SNHU's Leila Samii '07 '10G '14Ph.D., attendees will have the chance to learn more about Rev. Seifu’s extraordinary career, and how they can incorporate teachings of mindfulness and Zen Buddhism into personal and professional contexts. Do you have a question for our speaker? He can address mindfulness, entrepreneurship, international business, personal growth & transformation, and so much more! Submit your questions ahead of time to Ally Snell to make sure we discuss what you're hoping to learn. Rev. 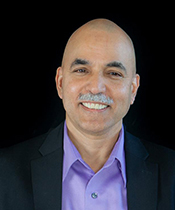 Seifu Anil Singh-Molares is a Global Executive Manager, with a varied career as a corporate leader at Microsoft and as an international entrepreneur. He currently leads a non-profit, Spiritual Directors International (SDI), and is a Motivational Speaker, a Zen Priest, and a Spiritual Director/Companion. In the past, he has had stints as a journalist, a scholar, a large event planner and director, and a non-profit expert. He led Microsoft's International Strategic Partner Program as Senior Director for twelve years, and has started and/or runs three non-profits: the Preeclampsia Foundation, the Compassionate Action Network, and SDI. Additionally, he has organized major international conferences, helped promising inventors value and sell their patents, co-founded a management consulting and international services firm, and advised individuals and groups on how to implement meaningful and lasting changes. Rev. Seifu Anil looks to combine the best practices from the world of business with a commitment to practical compassionate action. Rev. Seifu Anil was born in Holland and raised in Europe and the United States. Fluent in Spanish, French, and English, he is a citizen of both the United States and Spain. He feels fortunate with his liberal arts education, and cross-cultural upbringing, which helped him hone the skills he uses every day. Online registration is now closed... but there are a few spots still available! Please email us at alumni@snhu.edu to secure your spot. If you have any questions, please contact the Office of Alumni Engagement at alumni@snhu.edu or 603-645-9799.